We had Triscuits and cheddar on hand, and any good WASP knows that’s a fine contribution to a table. But, that’s a pretty classy snack. I wanted something fitting for football. So I scrolled through Pinterest and realized that I have some seriously amazing looking Football Food pinned. In case you’re wondering what makes something football food, I find it often involves dough and always involves melted cheese. Football food is snacking taken to the next level. If you’re going to be in front of a TV for hours on end, you want something hearty in front of you. This week, I passed up pizza buns and totchos (tater tot nachos, hello?) in favor of cheddar tailgating bread. 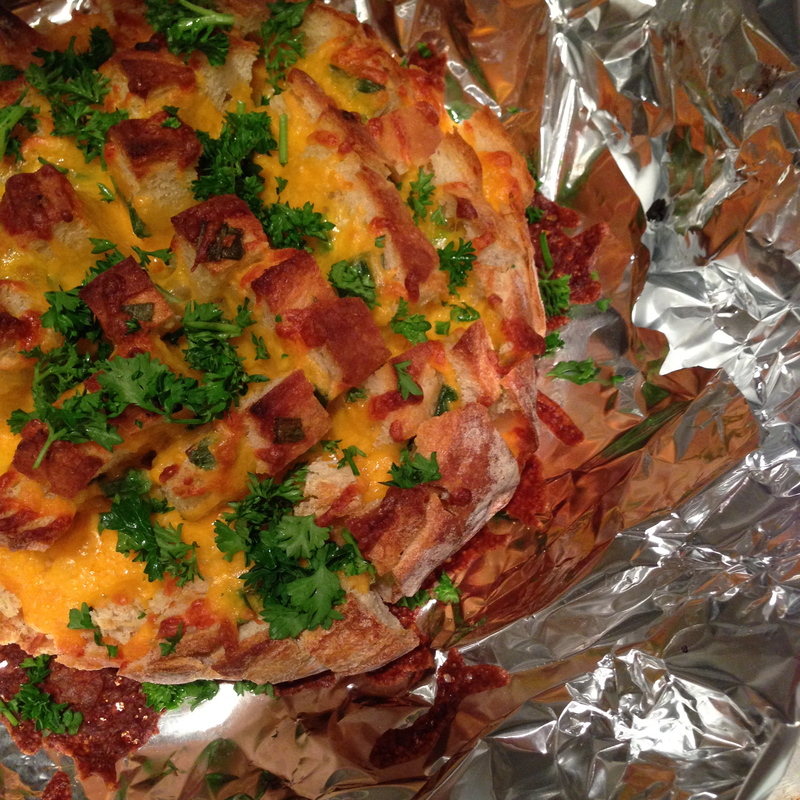 Cheddar tailgating bread is just right because it’s so grab-able. It’s a bloomin’ onion meets a loaf of bread, perfect for picking and pulling apart while screaming at the television all afternoon. We enjoyed the most relaxing football-filled afternoon. And though the feature presentation, a Broncos vs. Patriots game, was a total blowout, this loaf was anything but. It got rave reviews from anyone who came near it. One was just the right amount for five of us, so scale up accordingly. Preheat the oven to 350 degrees. Line baking sheet with two layers of foil, and place loaf in the center of the foil-lined sheet. Slice a one-inch grid pattern in the loaf of bread, slicing only about 3/4 of the way through the loaf. You want the bottom to remain in tact, while being able to fan out the small chunks you’ve created. Toast bread in the oven for 10 minutes. Add garlic and scallions to melted butter. Spoon butter mixture all over bread, opening up the loaf to make sure it slides into all the nooks and crannies you’ve created. Wrap foil tightly around bread and bake 10 more minutes. Remove bread once more, unwrap, and add cheddar to the bread. Again, take some time to smush the cheddar into the crevices of the loaf. Leaving the loaf unwrapped, bake 15 minutes. Top with parsely. How many recipes say that? And how many times do you ignore it? For me, I ignore it 9 times out of 10. And wouldn’t you know this is one time I went so far as to grab a bunch of the curly stuff from the shelf at the store, and chop it up to use here. I’m so glad I did. For what may be the first time in my life, I can confidently say the parsley added a little extra something here. Of course, you could use another herb here if that’s what you have. This entry was posted in EATING, savories. Bookmark the permalink. Forget the football. This was so RIDICULOUSLY good that I COULD not stop eating it!!!!!!!! !